Claire Chennault retired from the USAAF in 1937. Chennault had been an outspoken supporter of advanced fighter aircraft, but was at odds with many of his superiors who favored development of bombers. Chennault went to China to assist Chiang-Kai-shek in resurrecting the Chinese Air Force. In 1941 President Roosevelt authorized a plan to allow American servicemen to volunteer for a one-year duty assignment in China as members of Chennault's American Volunteer Group. 100 Curtis P-40s were rerouted from the UK to Burma. A like number of pilots and a few hundred support personnel filtered into the group from various branches of the service. The AVG engaged the Japanese in combat from late 1941 through mid-1942. Despite being greatly outnumbered, and facing critical shortages of supplies and spare parts, the AVG's official victory tally included 299 aircraft shot down and another 240 destroyed on the ground. The Flying Tigers have a special place in the hearts of aviation history enthusiasts. 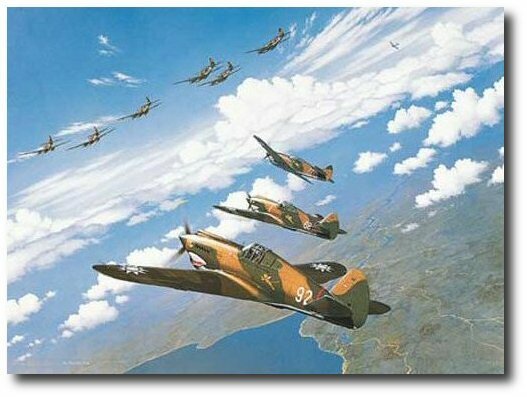 Each print is co-signed by 24 AVG Flying Tiger pilots, several of which are now deceased. This is a true collectors item for aviation history buffs and Flying Tiger fans, and potentially represents a an excellent vehicle for long term appreciation in collector value.